Dutch News reports that the Public Prosecutor in the Netherlands has declared that Geert Wilders’ anti-Koran/immigration film Fitna did not break any laws. At least not in Holland. In Jordan, however, a campaign group with the catchy name “The Messenger of Allah Unites Us” continues to press for an international arrest warrant against the Dutch MP. They have also produced a “boycott poster” showing Dutch and Danish products. Companies will only be removed from the list if they publicly denounce Wilders and the Danish media, and sign up for an international law forbidding the denigration of “prophets”. 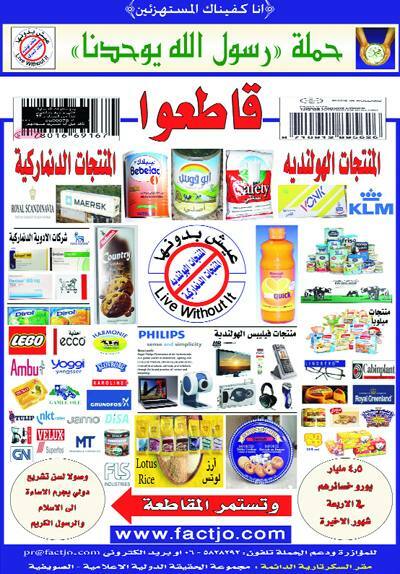 Two Dutch companies, Friesland Foods (dairy produce) and Zwanenberg (sausages), have already taken out ads in the Jordanian press doing just that. While the Jordanian action makes a refreshing change from death threats and embassy burnings, they do have damned cheek. Perhaps a counter-boycott is called for. Let all supporters of free expression undertake not to buy any…er…um… Damn those crafty Jordanians! UPDATE:(1 July) A court in Jordan has officially charged Wilders, and summoned him to appear before the court within 15 days. 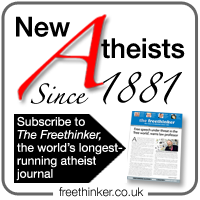 The charges include insulting Islam, defamation, and violation of online publishing laws. If Wilders does not appear, they will try to issue an arrest warrant via interpol. See what happens when you let people with the mentality of a five year old run countries! Mo-ham head Mo-ham head man with a preteen bride and a pig hat. I expect my fatwah by midnight. I’ll burn my own Embassies, though I am trying to give up.